KAMPALA– After five months of appearing in court, the investigations in which nine people are accused of being involved in the kidnap and murder of 28-year-old Susan Magara earlier in February this year are still incomplete. As required by the law, the suspects who are facing murder which is a capital offence are left with only one month to apply for a mandatory bail if the state fails to commit them in the High Court. The group appeared before grade one magistrate at Buganda road court Robert Mukanza for the mention of their case. The magistrate adjourned the matter until October 19, for further mention as police conclude its inquiries as sought for by the prosecution led by Ms. Patricia Cingitho. 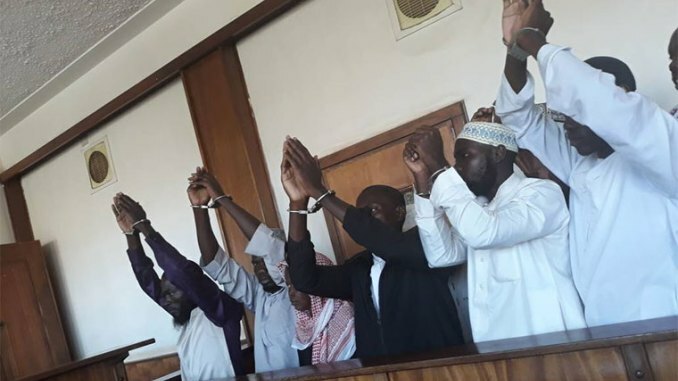 The suspects include; an Imam of Usafi mosque Mahad Kasalita, 2 boda-boda riders Yusuf Lubega and Muzamiru Ssali, hawker; Hussein Wasswa, a teacher Hajara Nakandi and businessmen; Abubaker Kyewolwa, Hassan Kato Miiro and Ismail Bukenya together with the recently charged suspect; Musa Abbas Buwembo . Prosecution states that the 9 suspects and others still on hunt on February 7, 2018 kidnapped Magara with intent to procure a ransom or benefit from her liberation from the danger of being murdered before going ahead to end her life on the Feb 27, 2018 at Kigo in Wakiso district.